What’s in a Walnut Crust? The walnut crust consists of 6 ingredients and can be made in a matter of minutes, especially if you have crushed walnuts that you bought that way. I personally buy the whole walnuts in 1 kg packets because I use them so much, but for convenience sakes, most supermarkets have small packets of crushed walnuts usually in the baking aisle with the flours and dried fruits. 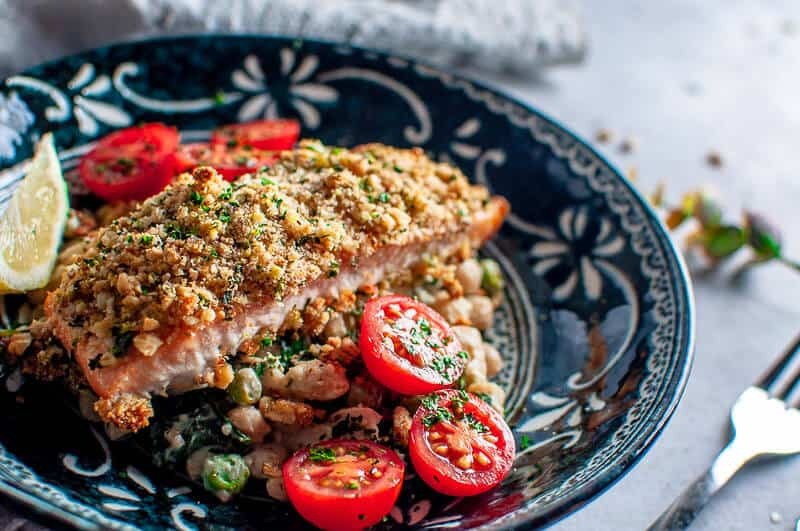 Mix all six ingredients in a bowl and then press gently onto the salmon (flat side down), so the crumb goes on top of the salmon (fleshy side up). Panko breadcrumbs are a Japanese breadcrumb that is more coarse than traditional breadcrumbs. You’ll find them in the Asian food aisle of your supermarket. 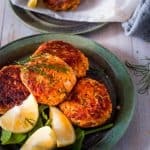 What Is The Best Way To Cook Walnut Salmon? 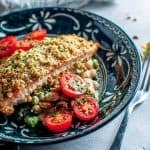 Nut crusted salmon in the oven is quick and easy. 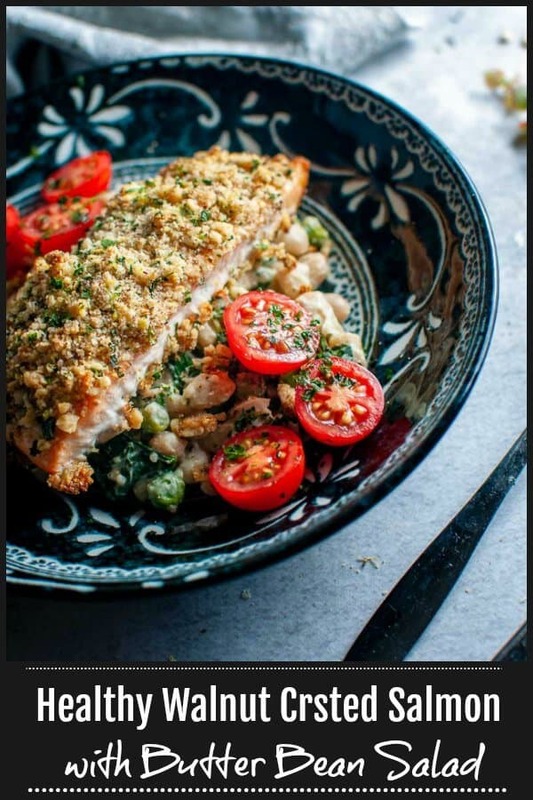 You need a baking tray, the salmon with walnut crust on top, and then a light spray of oil to keep it in place and to create that crisp golden walnut crust. 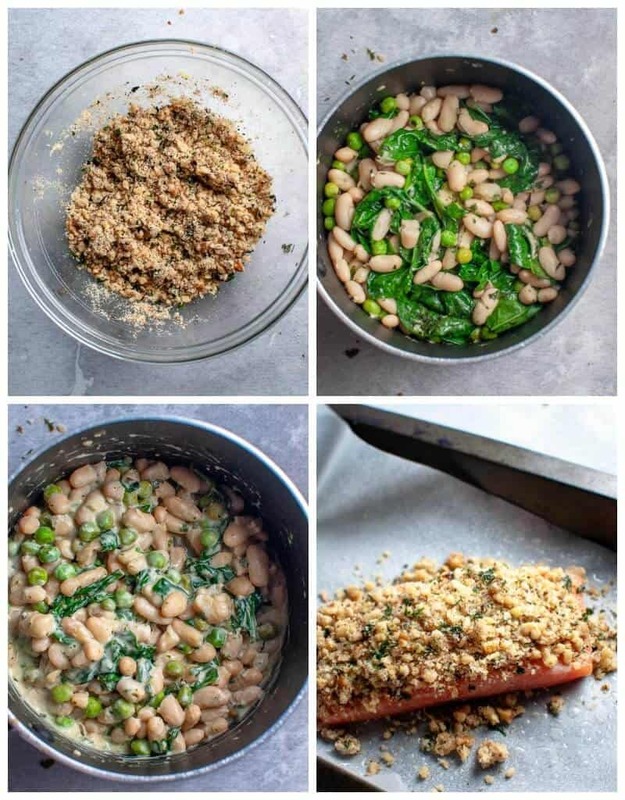 Bake Walnut Salmon in a hot oven 180 degrees C/350 degrees F for 15 minutes. 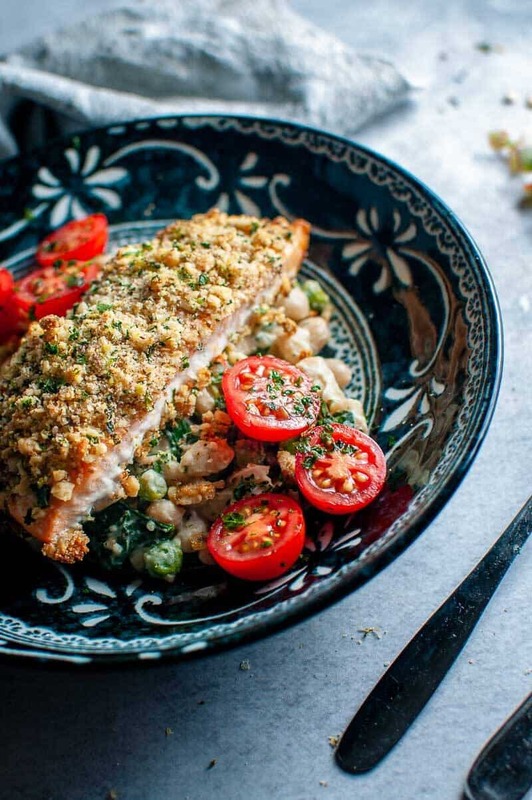 This should give you deliciously moist and tender salmon with a golden crunchy top. 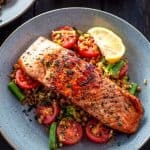 More Easy Salmon Dinners: Salmon Curry In A Hurry, Salmon Quinoa Salad,Salmon Burrito Bowl, Asian Salmon Salad, Salmon with Lentils Leeks and Tomato and Lemon Garlic Salmon with Creamy Mash. My first recommendation is the Butter Bean Salad as it has the right soft texture to complement the crisp and crunch of the walnut salmon. 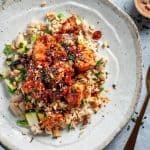 If you’re looking for low carb, cauliflower rice might be a good option or even lightly cooked zucchini noodles. TIP: I love this dish with the walnut salmon pulled apart/flaked apart with a fork, and then scattered over the butter bean salad. This is how I typically eat it as I find it easier and enjoy it more when the salmon and salad is all mixed together. I love my salmon dinners. Salmon is quick to cook, and keeps you full for a long time after eating it. This really helps to manage my after dinner cravings and stay on tray with my Clean Eating regime. 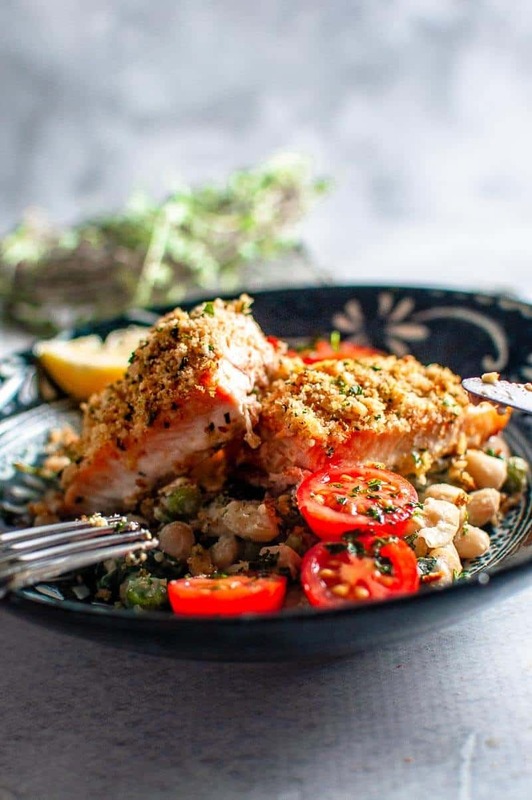 This Crumbed Salmon with Walnuts and Panko with Butter Bean Salad is a simple and tasty dish that takes less than 20 minutes to make. 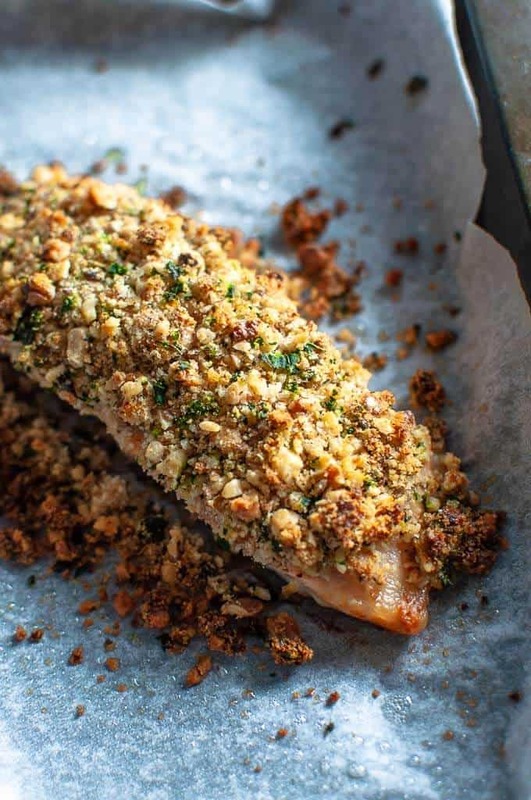 The nut crusted salmon is crispy, crunchy and the good omega fats will be sure to keep you fuller for longer. Preheat oven to 180 degrees C / 320 degrees F (fan forced). Line a baking tray with baking paper. Preparing the Crumb: In a medium sized bowl, add all the ingredients for the walnut crust. Mix until combined. Push the crumb on top of the salmon and lightly spray with cooking oil. Preparing the Butter Bean Salad: heat a pot on medium heat and add a little oil, add the garlic, butter beans, spinach and frozen peas. Stir until spinach starts to wilt. Remove from heat and stir through the Greek yoghurt, horseradish, a pinch of salt and pepper, and a little squeeze of lemon juice if desired. Divide Butter Bean Salad between two plates: Add the salmon on top, scatter the tomatoes and add a little more grated lemon zest and extra basil.